We keep hearing that math is all around us, yet many of our kids struggle with it. Even if they do well on tests, it seems that they don’t really understand it. How can we change that? Many years ago, I remember giving my kids in grade five some long division questions. The work was pretty typical of the math textbooks from the early eighties. One day Kyle (who always got straight As), was frustrated with me because, as far as I was concerned, part of being an effective math learner meant also understanding what we were learning. He repeatedly got all his solutions perfect, without any errors, yet didn’t really understand what an answer of “34 R6” meant. His lack of understanding, while getting all the right fill-in-the-blank answers, taught me a lesson. Before starting the division unit in late September, I gave the class two numbers (3 and 157) and asked them to show different strategies for showing how to divide 157 into 3 equal parts. I was amazed at how many strategies the class found! Forty-five minutes into the lesson, a student said, “Hey, we haven’t talked about long division yet!” How true. The kids were finding other ways to arrive at the solution of 157 divided into 3 equal parts, in ways that made sense to them. Each student would begin by drawing the number of circles indicated by the divisor (in this case, 3). Then, they would begin estimating the quotient (how many units in each circle). Students who are good at estimating might not have to write down 10 in each group followed by 20, followed by another 5 in each group, and so on. They might be able to estimate 50 in each group with some left over. Since estimation is a major foundational part of the math curriculum, and since knowing how to estimate is vital in everyday life, we were actually helping each other in ways beyond just the correct answer. The key when asking students to come up with their own strategies, is that whatever strategies they use, the better ones are accurate, flexible and efficient. Using tally marks to group might be accurate and flexible, but it might not be efficient for all students. After students brainstorm strategies, introduce the criteria for powerful strategies (i.e., accurate, flexible and efficient). Then, focus on the generated strategies that meet ALL the criteria, and go from there. For a free criteria template to try out with your class, go to my website under “Free Stuff” (www.zapple.ca). I have a few different versions you can try out in any subject area. If a student can divide using a strategy similar to the pizza method, but struggles with long division, does that mean they know how to divide? Of course it does. What is the bottom line? In the end, we really want to build kids’ number sense, while they learn and use effective strategies. My approach has been to start with the real world, and allow kids to invent strategies, but at the same time make sure the invented strategies are accurate, efficient and flexible. If we start with an old textbook from the early eighties, and do that “math,” we run into the problem that that is what kids think math really is. 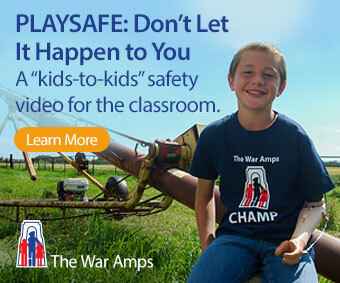 It isn’t always. Keith Devlin in his book, The Math Instinct, argues (with research) that babies as young as a few days old can distinguish between one-ness, two-ness and three-ness! What does that mean for us? It means that “math” is much more than the textbook or worksheet. It’s how we talk in the classroom, at home and how we engage mathematically in our world. But, it’s not always that easy. It helps when others allow me to take some risks. It’s good when I listen, and when others listen to me as I learn. I need to try things in more than one way, even if it seems wrong at first. I need to make mistakes. If I feel free to make them, then I’ll really learn. One of the ways that we’ve heard at probably every math workshop we’ve ever gone to is to make math “fun” and “engaging.” In some ways, this helps with perseverance and patience, as our students get into the learning without always realizing they’re learning. With that in mind, I created a really cool resource and field-tested bits and pieces in my class, and in its finished form, it’s been used in classrooms across Canada. 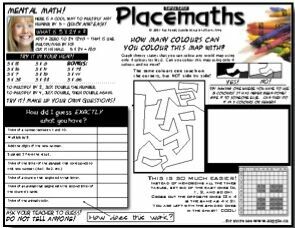 For a free sample that you can use in your class tomorrow, go to my website under “Free Stuff” (www.zapple.ca), and look for the “Placemaths” sample. Do students have to do the whole page? Should we formally assess everything they do? Can students simply be engaged for engagement’s sake? Of course, I found that the answer to 1 and 2 above is “No!” while the answer for 3 is a resounding “Yes!” Using the Placemaths taught me that students can select parts or all of the page. I’m not formally assessing the “page.” However, to boost confidence and learning, I used it as a place to begin math conversation, as a preview of what was to come, and even as a refresher. Because the students didn’t feel as though my evaluating eyes were upon their every stroke, number and line, they were more relaxed and more open to try. Research shows this as well. In one study cited by Daniel Goleman, math scores increased by at least 10% when students were more relaxed. We want our kids to develop best practice and healthy, persevering attitudes, including those in math. If I can look at how I struggle and learn in my own life, I can be more empathic to students as they struggle with their learning. That got me thinking… (this was the tough part) how was I approaching math? What were my attitudes? Where was I getting frustrated? This made a difference. Firstly, I noticed a pattern in the way I was speaking with the students. Essentially, I used a pattern that Gordon Wells calls, “Initiation-Response-Evaluation.” I initiate a question, I get a response, then I evaluate. Notice that with this pattern I’m speaking two out of the three times per unit of conversation in the math class, and doing most of the work. This struck me as interesting. If I was doing most of the talking and evaluating, then what was left for the students to do? I decided to do a few things. Firstly, I listened more to the students. What were their ways to solve problems? How many different ways could they solve 48 + 52 without using pencil and paper? How could they estimate? What strategies could they use? Were they using strategies that were efficient, accurate and flexible? Secondly, I decided to allow mistakes to be made. I had been saying this in my class for years (“It’s okay to make mistakes”) but did I really believe that? If so, how far did I believe that? In allowing kids to make mistakes (and openly share those) they felt more comfortable to persevere. But, here’s the secret! Use peer sharing throughout the math class so students feel more comfortable taking risks and sharing with their peers first. Then, slowly build yourself into the picture. Often, kids will listen to their peers more than they’ll listen to you. Use that to aid the learning process. You can start by asking them to show one example of where they learned something really well, and one example where they didn’t. Thirdly, I realized that learning takes time. Imagine if you were learning a new math resource, textbook series, or a new provincial math curriculum. Is it easy? Are you struggling? Are you ready to throw down your pencil on your desk? Of course, but like anything meaningful, it takes time. When I say that things take time, I don’t mean that we should spend all of September and well into October teaching place value until every student gets it. That can be a waste of time, particularly if it’s not in context. What I mean is that we should layer and repeat throughout the year. As well, we need to continue to build number sense while we help kids to estimate. What have I learned? I’m a learner too. Just as I struggle with keeping fit, or going back to take courses, or learn a new math resource, textbook series, or a new provincial math curriculum, so too do my students struggle as they learn. It’s part of life. 1. Ask the students how the topic fits in with everyday life. 2. Give the students the problem and the solution. Then, students use strategies to show how to get there. 3. Ask students to write word problems instead of just answering them. This will show you to what extent they understand. 4. Ask yourself “What is the bottom line?” If it’s to build numerate students with a deep sense of number, then do they always have to show it in only one way? 5. Continue to listen to your students. It’s always fascinating how they arrive at solutions, use mental math or invent strategies. Ray Appel has taught grades 2 – 7, been a Faculty Associate at Simon Fraser University and a District Math/Science Coordinator. Ray has also written extensively for Pearson Education Canada. He continues to write, create on-line video clips, and do workshops across Canada, squeezing in time with kids in classrooms! Find out more (much more!) on Ray’s website: www.zapple.ca. You can reach him at ray_zapple@yahoo.ca.